Originally, this fascinating work was printed as an egoyomi calendar that included numbers for the months (and a seal), but they were omitted from this old reprint which is of excellent quality. 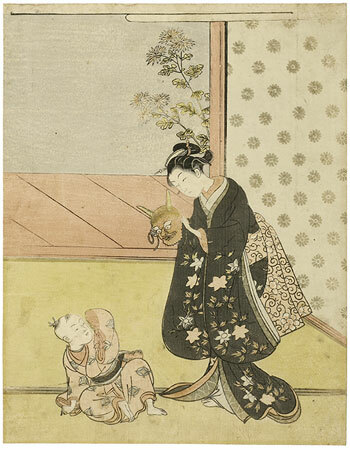 It is possible that the woman and child with the oni mask are an allusion to the warrior Watanabe no Tsuna (10th c.), who chopped the arm off a devil (oni) with his sword at the Rashōmon Gate. There are two states of this charming print. The first, a calendar print for 1766, conceals the numbers for the short months of the lunar year in the centres of the six grey clematis blooms on the young woman’s flowing sleeves, and bear and hand-stamped seal reading “presentation” (shinjō) in the upper right hand corner. An impression of this state is in the Musées Royaux d’Art et d’Histoire, Brussels. This print is a reissue with the calendar marks removed and the seal omitted, but judging from the delicacy of the colours it was printed close to the time of its original publication. Many of the unsigned Harunobu calendar prints allude indirectly to historical or legendary subjects. Perhaps there is a reference here to the visit of the medieval warrior Watanabe no Tsuna to the devil-haunted gate of Rashomon, or the story of the Akuta River (catalogue no. 9). Reproduced in Ingelheim catalogue, no. 26.